Hooray for another extra income idea blog post here on SavingsPinay. I am calling bloggers and digital content creators I know to maximize the potential of their site through the fastest growing online travel e-commerce company in the Philippines, TravelBook.ph. If you are interested on how to make money with TravelBook Affiliate Program then this post is for you. 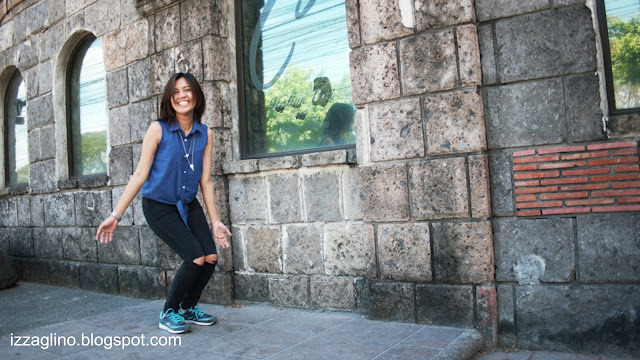 I first encountered TraveBook.ph during the iBlog: The 11th Philippine Blogging Summit. They had a booth inside and generously gave away free Get Go Lifestyle Rewards Card from Cebu Pacific which I also feature here on the blog. Anyway, TraveBook.ph is an online booking service dedicated to offering great value hotel booking for every Juan. They offer utmost convenience by providing a user-friendly portal with the largest online catalog for Philippine hotels and resorts. Whether you are traveling in Baguio, Batangas, Bohol, Boracay, Cebu, Davao, Laguna, Metro Manila, Palawan, Pampanga, Tagaytay, Zambales and more you’ll definitely find a place to stay with TravelBook.ph’s over 1,200 partner hotels. 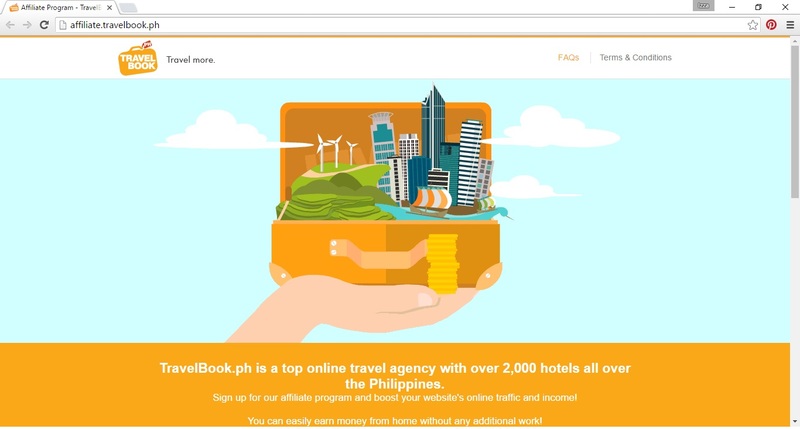 Aside from being an online solution for tourists, TravelBook.ph also offer an Affiliate Program perfect for bloggers and content creators who constantly seek for new ways to generate income. The TravelBook Affiliate Program offers an opportunity for you to earn through simple promo tools like banner ads, links and widgets you can implement for free on your blog. 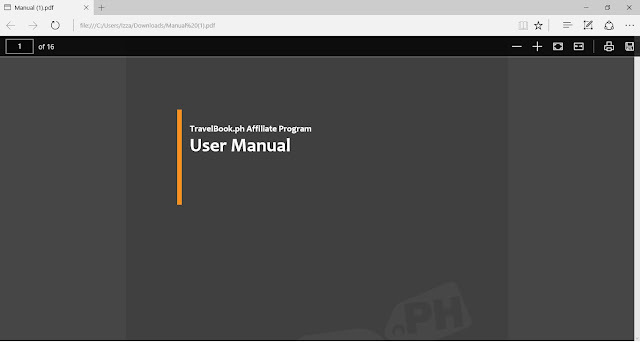 How TravelBook Affiliate Program Works? Banners come in different sizes that can fit anywhere on your blog template. 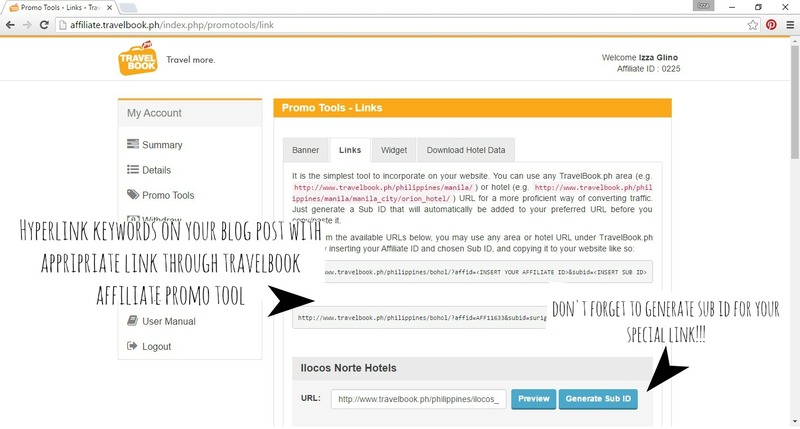 It gives real-time offers on TravelBook.ph partnered hotels. 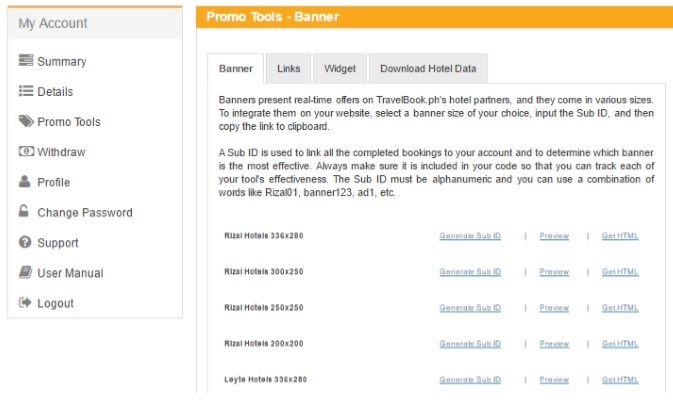 You can integrate this easily by selecting a banner size, typing a Sub ID to link in all completed bookings to your account and getting the HTML code to add on your site. Links is one of my favorite promo tool from TravelBook because its super easy to include on the blog. 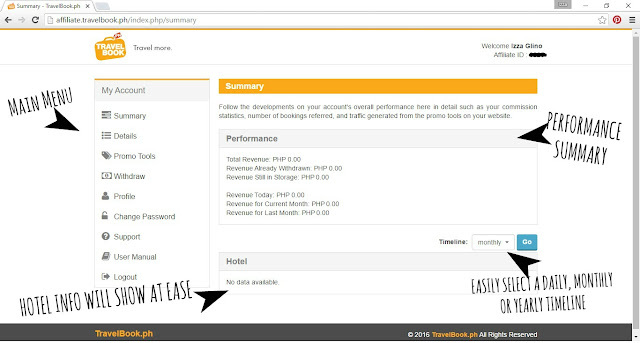 All you need is to copy and paste the URL from any of the TravelBook.ph area or hotel as seen on the photo below. Paste this on the keywords of your blog post. Widget is a ready-made search box that your readers can easily use to book for accommodations on their next trip. It is very simple to set up. All you have to do is copy the widget code and add it on your blog’s side bar, footer or anywhere you want! 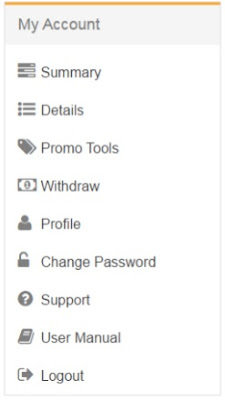 Once you login to your account you can easily navigate through to the TravelBook Affiliate Portal. This is where you track your progress, add promo tools mentioned above, withdraw money and manage your account. It works in a what-you-see-is-what-you-get type so you won’t have hard time exploring your own TravelBook Affiliate Account. Summary – Shows a quick overview of your account performance from revenue statistics, booking-related data and website traffic. This also the default redirection page of the website. 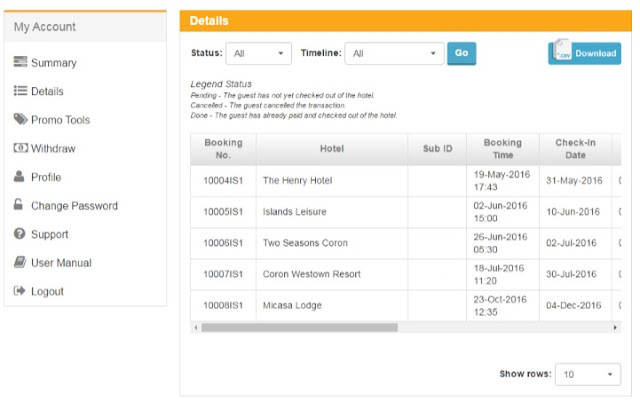 Details – Gives you more details on each booking transaction made through your TravelBook Affiliate account. It lists down all the important information on all booking linked to your account including booking number, hotel name, Sub ID, time of booking etc. Promo Tools – Provides quick access to a variety of promotional tools to promote TravelBook.ph. Withdraw – Simplifies withdrawal of your earned money. 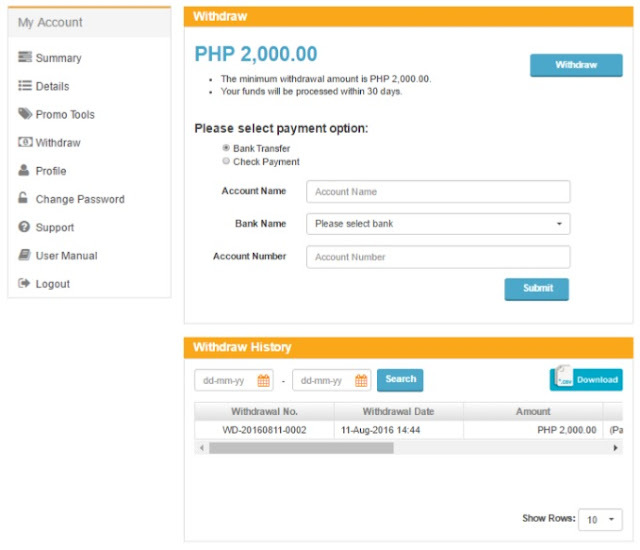 You can select either bank transfer or check payment as payment method. Processing of each withdrawal requests will take 30 calendar days. Profile – Shows all the deatils you submitted during your application. This is also where you’ll find your Affiliate ID or the unique identifier you can use to get all booking transactions and commission details connected to your account. Any changes done will be reviewed and approved by TravelBook,ph Affiliate Team within 5 working days. Change Password – Allows you to update your account password. 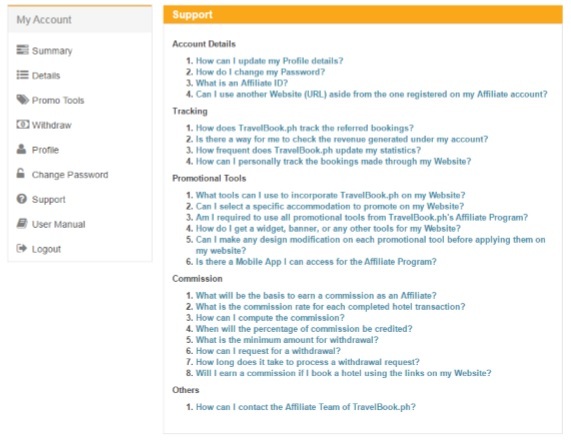 Support – Helps you with all your questions and inquiries as a TravelBook Affiliate. It contains all the information you need. User Manual – Lets you download the TravelBook Affiliate User Manual anytime. 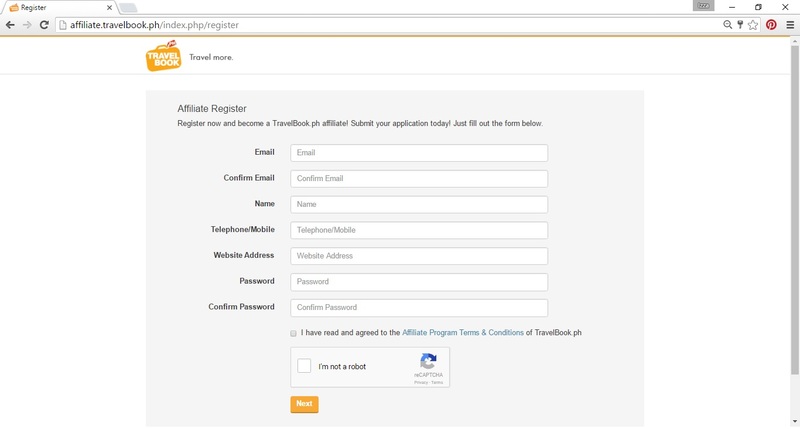 How to Apply as a TravelBook.ph Affiliate? Step 2. Ensure that all required data are provided such as website URL and your personal information. Step 3. Upload a scan copy of your ID for verification purposes. This is done on the online registration form as well. Now, anyone can join the TravelBook Affiliate Program as long as you have a blog or site to register. TravelBook.PH will review your application and you will receive a confirmation via email once you become an official partner. The processing of application will take 5 working days. Mine however took only a day if I’m not mistaken. I registered on a Monday and got my confirmation same day. You too can start earning as a TravelBook Affiliate. If you already have a blog or wanting to start a blog then here are ways you can get up to 65% commission per transaction. As a seasoned blogger I know for a fact that you the only way you can succeed in affiliate marketing is by recommending what you use and honestly believe in. If you don’t travel and you are not an out-going person then you TravelBook Affiliate Program might not work that well for you. This is one of the coolest promo tool ever because you its always a win win situation for you and your readers. Your readers can book their next trip conveniently on your blog and you earn through it. The design of the TravelBook Widget is also nice and it fits perfectly on every blogger’s template. From your TravelBook Affiliate go to Promo Tools. Click Generate Sub Id and type an alphanumeric code used to link all the completed bookings to your account. Mine for example is my name + a 4-digit number. Note: Don’t forget to change the width and height of the code based on your blog’s size. Wait for a few minutes for it to load fully on your blog. These posts will give you a lot of opportunities to earn through TravelBook’s Link Promo Tool. Implementing this is a matter of copy+paste so you won’t need any formal training whatso ever. List Posts. Everyone loves to read a good lists on a blog. 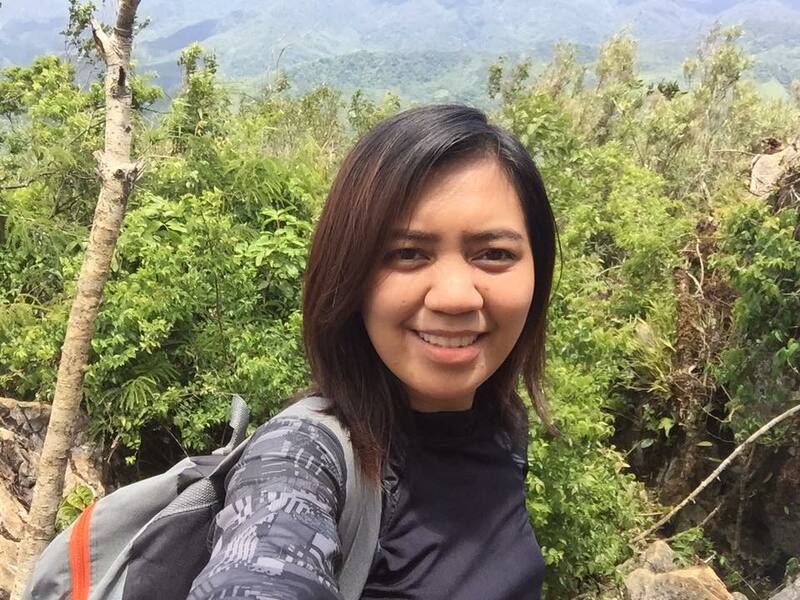 Create post on Top 5 Places to Visit before 2016 Ends, 10 Things You Should Bring On a Solo Trip etc. How To’s. Give away information to your readers through How To posts. From How to go to a certain plan to How to Book Your Next Trip Stress-Free. Travel Guides. Select a destination and become a local expert for the public. Guide us to what to see, what to do and where to eat on the said area. Note: Make sure that you insert only the appropriate Affiliate Link on your post. Your readers will not like it if they get redirected on a page that has no connection to what they just read. 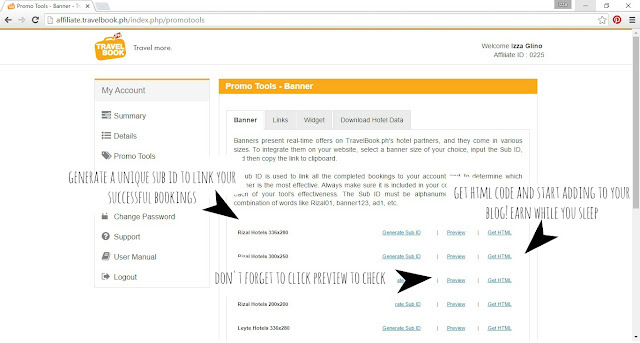 Being part of the TravelBook Affiliate Program entitles you to a ton of Banners you can add directly on your blog. They come in different sizes to maximize your earning potential. How to Effectively Add Banners on Your Blog? Make sure that you have included a Sub ID before copying your widget code this is to track any bookings made successfully through your banner. Choose the size that match your sidebar. Most side bars support 300×250 size. Put the Banner on a spot where it could be seen by your readers. This is either on top or at the center. You can also include Banners inside your blog posts. Just go to the HTML side and add the code. Let them know how they can book their trip online without any hassle. Your family and friends will be very much delighted to use your code or book their trip to your blog’s widget for sure. Use this as your advantage too. How Much Extra Income Can You Earn as a TravelBook Affiliate? The TravelBook Affiliate Program lets you make money through commissions on booking made through your site. You will be paid a percentage of the total gross commission earned from completed transactions of each guest coming from your Affiliate ID. The higher number of successful hotel or resort bookings, the higher percentage of commission you will receive. Once your total commission reaches 2,000pesos, the affiliate can request withdrawal. The payment method will be through bank to bank transfer or check payment. For questions and further about the Travel Affiliate Program you can easily go to the FAQs page. Why Become a TraveBook Affiliate? 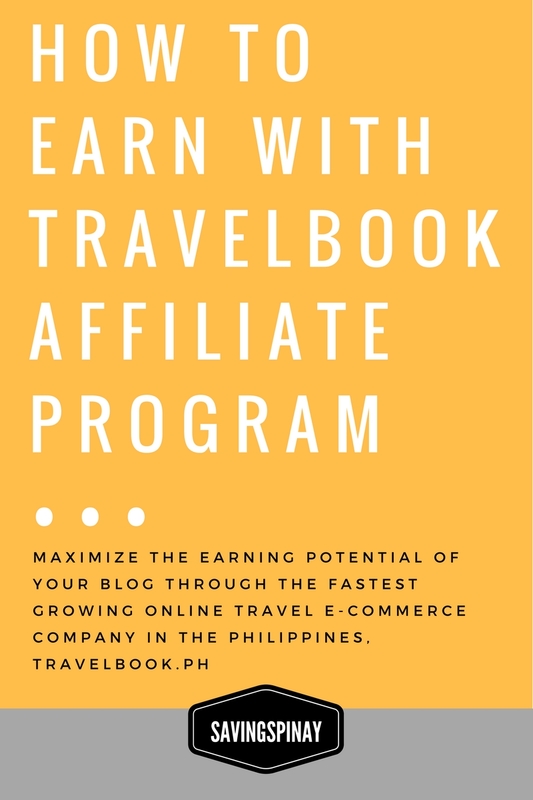 To be honest, TravelBook Affiliate Program is one of the best program currently available in the Philippines today that bloggers and content creators must join. I am fond of traveling and I have bucket list of places I want to visit. I have also published a couple of posts here on SavingsPinay that venture on the Travel Niche. If you are looking for a new means of extra income online that won’t hurt your blog, TravelBook Affiliate Program is the next big thing. Their Marketing Team is also very friendly and accommodating to questions. I love that they make ways to strengthen their rapport to digital influencers. Join the TravelBook Affiliate Program now!